Talk to Gossip who can be found south of the Sinclair Mansion. Head to Gossip who can be found south of the Sinclair Mansion, and speak to him. He will tell you that Anna has been arrested and King Arthur has disappeared. 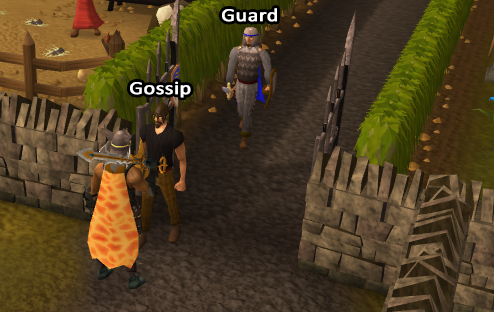 After this shocking information, he will also tell you to speak to the Guard who can be found just north of him. He would do it himself, but would lose his job for doing it, so needs your help. Head north to the Sinclair Mansion, then to the east side just south of the Dog. You will find a window that you have the ability to break. 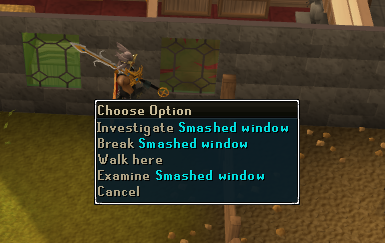 Break this window, and you will find yourself inside the Mansion. This is how you will be getting in and out of the building for the time being. Just north of the place you find yourself, on the floor, is some Scrap Paper that you should take as evidence for there being a link between the Sinclairs and Camelot. Now that you have the Scrap Paper, head upstairs and into the large room in the middle of the floor. Search the Bookcases to find a Black Knight Helm for evidence that there has been foul play, and take the Address Form from the table for evidence of the Sinclairs leaving. Once you have all three, head back to the Guard who will take them off you, and say that it will take over a month to get this evidence to the right people. This is certainly too long, so once again super you will step in and say that you will make sure things can happen quicker. To do this, you will need to learn more about the History of the family, and Gossips are the best people to do this, so go and talk to Gossip again. 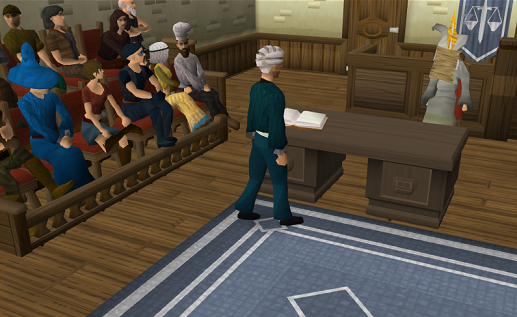 After talking to him about everything you can, head to the Courthouse in Seers' Village, and talk to Anna. She says that she may know where her family is, but will need a favor from you - somebody to prove that she was 'Not Guilty' of murder! If you can do this, she will tell you about a secret passage straight into Camelot. To get information about what actually happened, she will tell you to talk to the servants at the house about what happened, and give you a piece of thread to try and get information about as another piece of evidence for her innocence. Head back to the Sinclair Mansion and talk to all 6 Servants - Hobbes, Louisa, Mary, Donovan the Family Handyman, Stanford and Pierre - about everything to do with the murder to gather as much information as possible, and work out which ones will help proves Anna innocent. Once you have got all the information you need, head back to the Courthouse, and go down the stairs. First will be a statement by those who feel that Anna is guilty. It's then your turn to do your job and prove Anna's innocence. To bring up a witness, talk to the Judge, and choose who you want, then talk to the witness, and choose what you want them to speak about to get the information put forward. After each person has put forward their evidence towards Anna's innocence, the jury will talk among themselves before the judge tells them to be quiet. 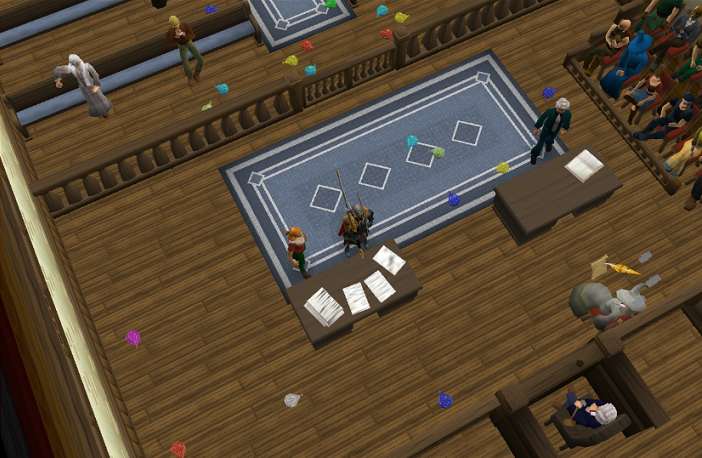 After all the witnesses have put forward their evidence, as long as all the right evidence was given, Anna will be declared Not Guilty and the Courtroom will fill with Balloons! If something went wrong, you will have to start again from the beginning. Leave the courtroom and speak to Anna again, and she will explain the location of the secret passage she mentioned earlier. 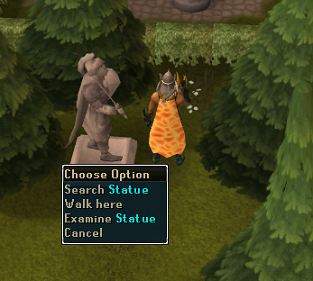 Head up the eastern side of Camelot Castle and you will find a statue. 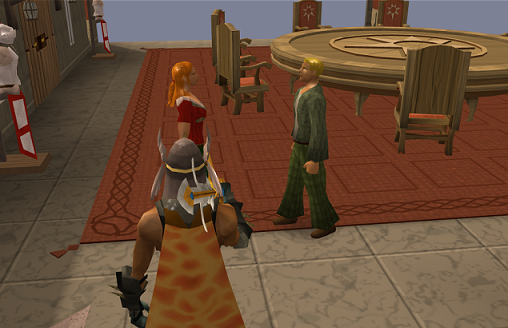 Search it, and you will find yourself within a cut-scene. It will become clear that there is something wrong going on, and that you've been lured into a trap, and then 'She' wants to see you. This 'She' will turn out to be Morgan Le Faye, who will tell you that you will find the others soon, other than Arthur who is "a bit...busy at the moment". You will find yourself in a cell with Merlin and the Knights of Camelot. Talk to Merlin who will explain the situation, and explain that King Arthur has been turned into a Granite Statue with the Black Knights, and the Holy Grail has been stored in the Keep Le Faye. On one of the walls in the Cell is a Vent. Choose to reach it, and you will call the knights over, who will stand on each other's shoulders and let Merlin escape. If you wish to leave yourself, choose to Reach Vent again, and you will find yourself beside a pile of crates. 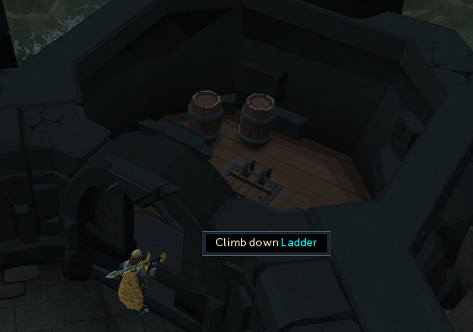 Hide inside one of these crates, go through the text, and you will find yourself near Catherby Docks. Now that Merlin has escaped, you will need to get the other Knights out. Talk to each of the Knights, who will give you spare items that they happen to be carrying. 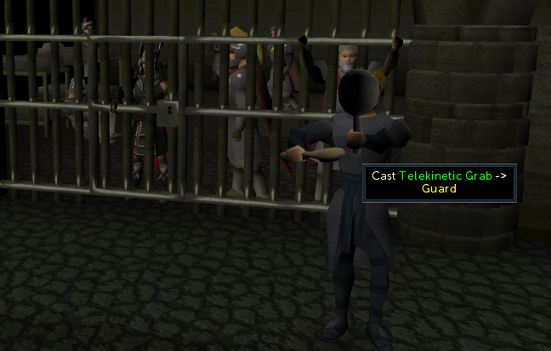 Once you have a Law Rune and an Air Rune, cast the Telekinetic Grab spell on the Guard who is wandering around outside the cell, and you will get a Hair Clip. You can also use a Lockpick instead of a Hair Clip if you had one with you. Now it's time to try and open the Door to the cell. The general idea of the door is similar to the board game Mastermind. You have 10 attempts to guess what the combination is, and after each attempt you will be shown whether the number put in that column is correct, in the wrong tumbler, or completely wrong altogether. 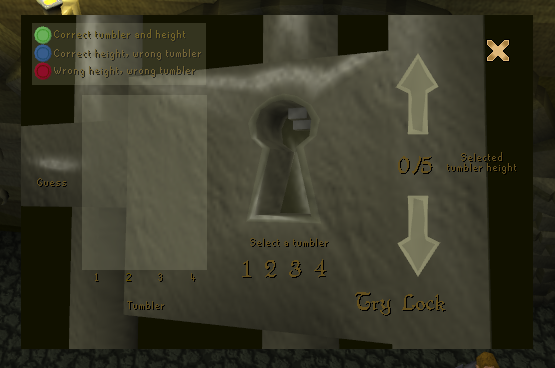 To set the value of each tumbler, click on one of the large numbers under the lock, then click the up and down values to raise and lower the value. Each tumbler can have a value of 0, 1, 2, 3, 4 or 5. Once you have set it the way you want, click the 'Try Lock' button, and the results of that attempt will show in the grid on the left of the screen. On the first go, setting the values as 0, 1, 2, 3 is helpful since it lets you know if any of those numbers occur in the solution. If you haven't solved it after 10 goes, the lock will re-set, and you will have to start over again. If you did manage to solve it within 10 attempts, you will find yourself in the Keep Le Faye surrounded by fighting Knights. Head up two sets of stairs and you will find a table that needs searching. 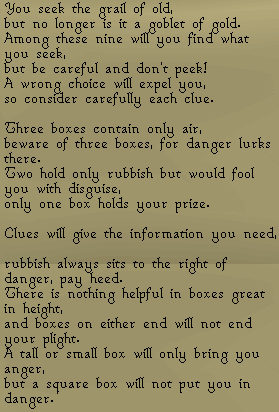 Upon searching, you will find a series of boxes and a riddle to help you work out which one has the Holy Grail in. 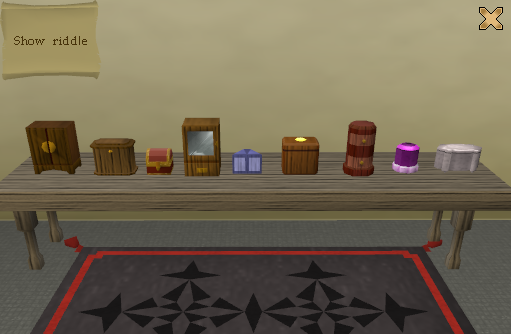 After working out the riddle, you will work out that the box with the Holy Grail in is the purple box 2nd from the right. If you get the right box, you will get the Holy Grail. 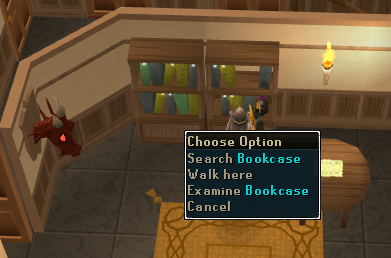 If not, you will find yourself back in the cell or in a random location such as south of Ardougne. 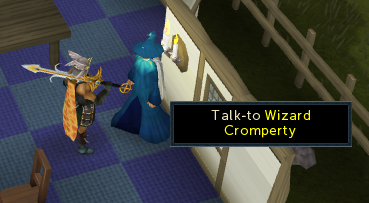 Now that you have the Holy Grail, head to Wizard Cromperty who can be found in a building in the north-east corner of East Ardougne. He will explain how you will help King Arthur escape from his current rocky state, and that you will need some Granite to help you do this. He will give you an Animate Rock Scroll (if you don't still have yours from One Small Favour), and explain that you will need more than just an Iron Chainbody and Bronze Med Helm to get into the Black Knights' Fortress. As well as this Iron and Bronze Armour, you will need a Black Platebody, Platelegs or Skirt, and Full Helm (including trimmed or gilded armor). 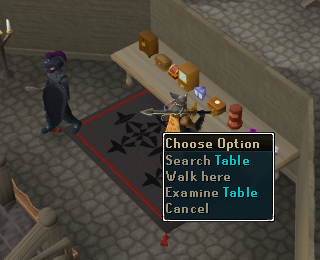 To get the Granite, head to the Quarry located in the Kharidian Desert, and either mine some yourself, or pick some off the floor that somebody else has dropped in their aim to powermine as quickly as possible. 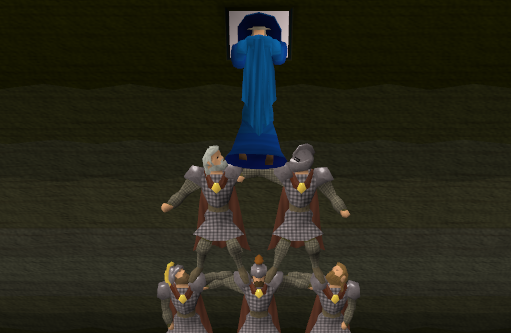 With the Iron Chainbody, Bronze Med Helm, Granite, Holy Grail, and Black Armour, head to the Black Knights' Fortress. Enter the Fortress, go immediately west and head down the ladder. 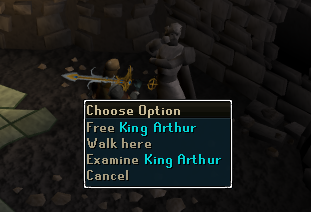 You will find yourself in a room with the Granite Statue of King Arthur, so choose to free him. A cut-scene will show him breaking out of the rock, then he will take the Iron Chainbody and Bronze Med Helm before telling you to meet him in Camelot Castle. Head to Camelot Castle, and talk to King Arthur. On the top floor of Camelot Castle is a room in which you will have to kill a number of Knights of Camelot in a row without Prayer, with each Knight being more challenging than the previous. If you do die, you will not lose any items, but if you leave, you will have to start again. 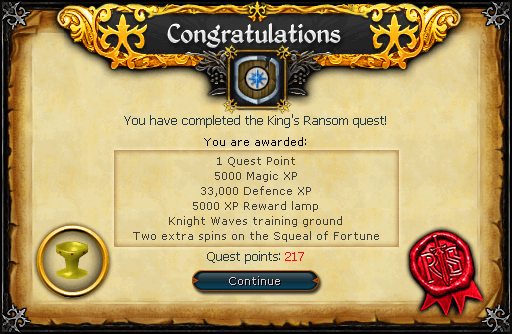 For more details about this miniquest, please see the Knight Waves Training Ground guide.